I used Habanero chilli which is literally crazy hot. So I blended ¾ and chopped ¼ amount of chilli. If your chilli is not too hot, you can just chop it. But I will say, try to make with hottest you get. 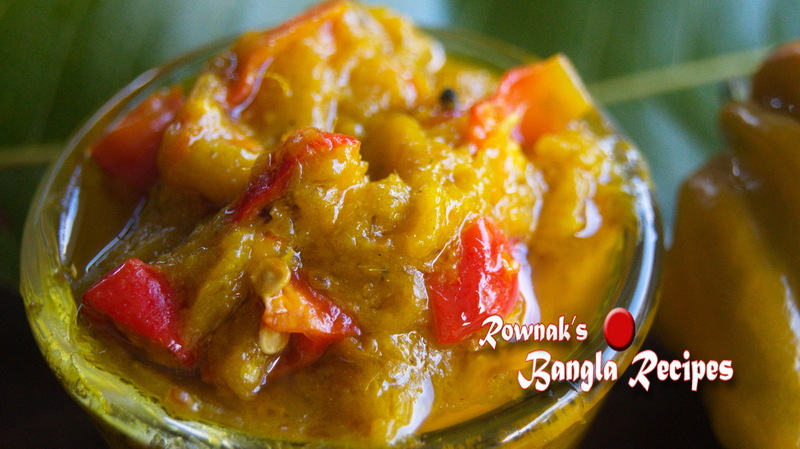 To balance heat I used mango in this pickle, but you can use olive, tamarind paste. 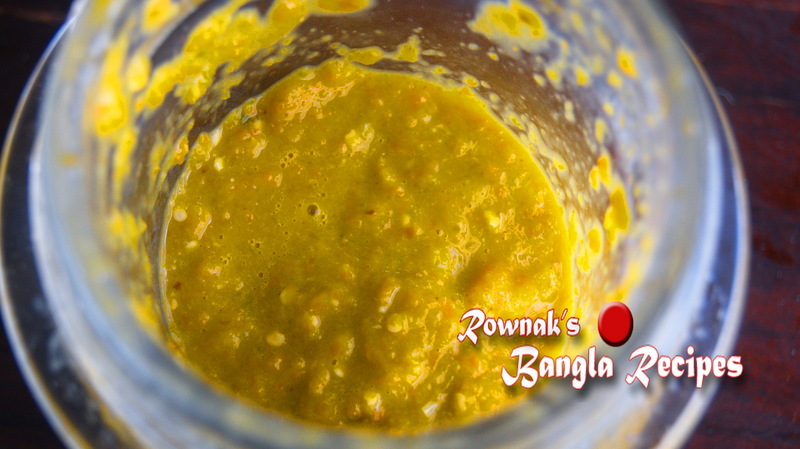 As you know Habanero Chilli Pickle/ Bombai Moricher achar has to have little amount (not spoonful!!) to enhance taste of your meal or you can add it in meant curry. 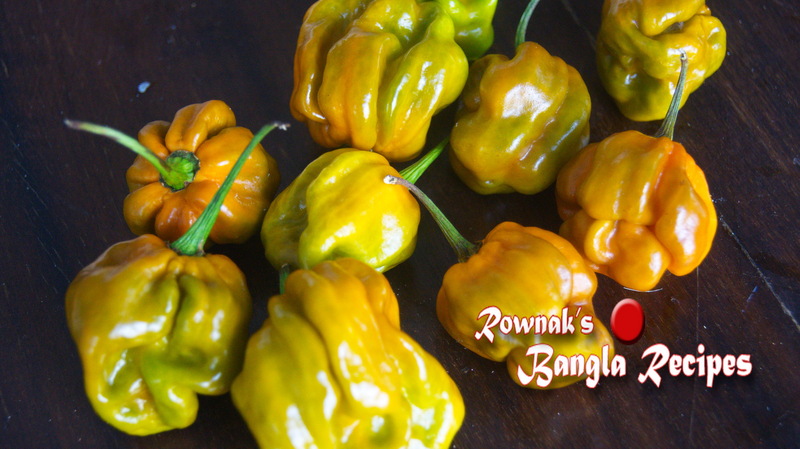 So enjoy the heat of Bombai morich (habanero chilli). N.B. Panch phoron is five whole Bangladeshi spice mix(fenugreek seed, nigella seed, carum seed, mustard seed and fennel seed). Panch means five in Bengali. If you cannot find carum seeds you can substitute with celery seeds. Sadly find Wikipedia gives wrong description of panch phoron consists with cumin seeds. Cumin seeds never use for Panch phoron. Blend ¾ amount of chilli and chop rest. Grate mango and dry roast pach phoron(be careful while you are roasting, it does not take long); grind it. Heat the oil; when oil is ready, add Panch phoron and garlic. Wait half minute and add turmeric and mustard paste. After minute add vinegar, mango and salt; bring it to boil and add chilli. Cook 2-3 minutes and remove heat. 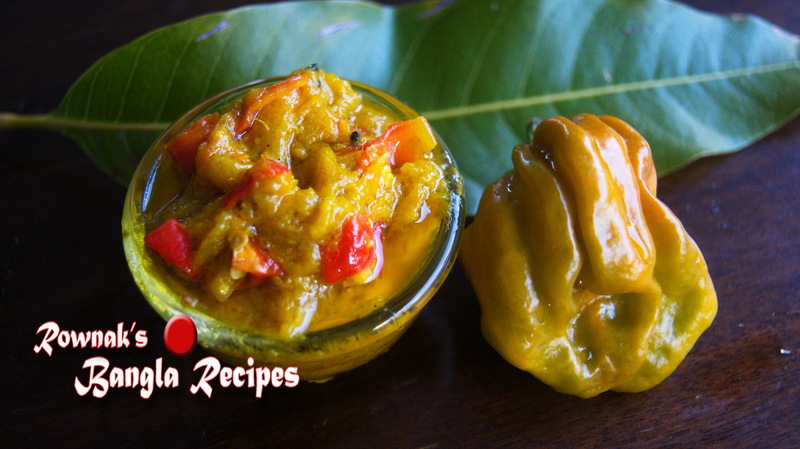 Store Habanero Chilli Pickle/ Bombai Moricher achar when it cools down. Enjoy. Be careful when you are handling chilli, specially pasting and chopping part. You can use bit of vinegar when you are blending chillies.